Sweet, salt and savory all come together in this super easy to make appetizer. In fact, it’s almost embarrassing how easy this is to put together. 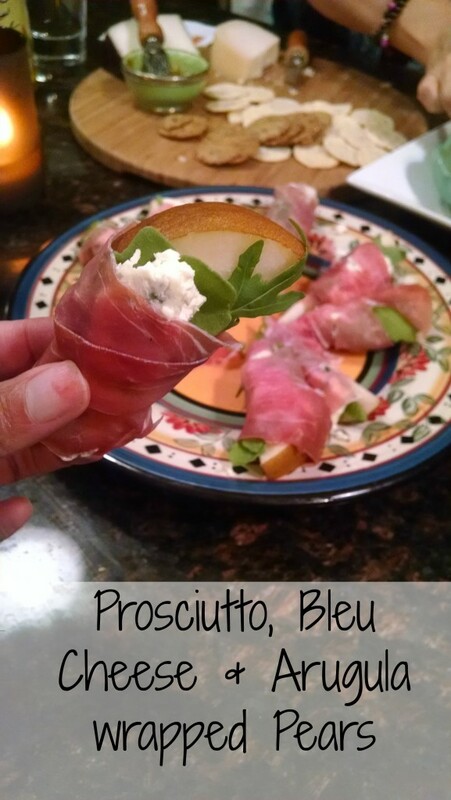 These prosciutto, bleu cheese and arugula wrapped pears require no cooking. Just cut, stack, wrap and eat. Every week I try to get together with the girls. We use watching Scandal as our excuse but really it’s a chance for us to get together and catch up on what’s going on in our lives. Most of the time we enjoy popcorn and wine but every so often we change things up. Kelly introduced this appetizer to us and it’s delicious. Like I said, it’s the perfect combination of salty, savory and sweet. And this couldn’t be easier to put together. Simply slice red pears (for color), top with arugua, a slice of bleu cheese and then wrap with some thinly sliced prosciutto. Arrange on a plate and dig in. It couldn’t get any simpler. This is my new favorite go-to appetizer recipe. What’s your favorite? Add in the comments below. I’d love to hear from you.